A new cidery is opening this summer in Bellingham, Washington: Herb’s Cider! Founded and owned by Tim “Herb” Alexander (you alternative rock fans may recognize him as the drummer of the band Primus), Herb’s expansion will include a production facility and a 50-seat tasting room in separate locations in Bellingham. Production will be overseen by Head Cider Maker Chris Weir, formerly the original cider maker for Finnriver Cidery (who currently makes and co-packs Herb’s Cider, made with 100% organic Washington apples), and was more recently a brewer for Port Townsend Brewing Co. Alexander and his wife Shama will head up business operations and the tasting room. 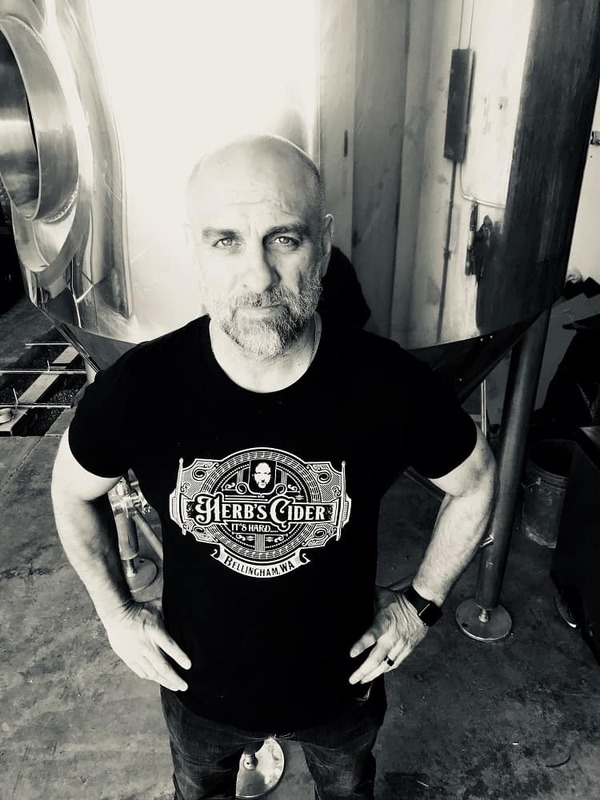 We recently got the chance to chat with Alexander about this new project, and learned about how he got into cider in the first place, and discussed what lies ahead for Herb’s Cider. Cider Culture: So, how did you get into cider in the first place? Tim “Herb” Alexander: I’ve never been a big drinker of beer. Never. I never liked it. And then, you know, I started dabbling in wine a little bit, and then when I was working with the band Pucsifer … our stage setup was like, there’d be a table in the middle of the stage and when we weren’t playing we’d sit around this table and drink wine. It was kind of an interesting live music thing and I started drinking a lot of wine during that time. But after a couple glasses of wine, I’d get a little tired of it. I don’t remember when but I tried cider first, but I was like, “Whoa this is really good!” It’s somewhere between a wine and a beer. I thought it was cool and started going down that road and enjoying ciders and developing a taste for them. Did you ever try to make cider? Yea, when I was living on this property we had some apple trees and some pear trees and we picked some, invited people to take them and had a bunch leftover. I didn’t know what to do with them, and thought I’d try making cider. I rented a press and pressed them and went through the process and made a small batch and just loved the way it tasted. I thought maybe it was an avenue I could go down … I’d been looking for some other business avenues outside of music. I’ve done music my whole life and really not much else and so for a couple years before this, I’ve been looking at different things. I thought maybe I’d get into the marijuana industry but was a little uncertain about the stability of it, it’s a little too shaky for me. How did you start building Herb’s Cider as a business? The process began with getting the name, figuring out what it’s gonna look like, and it’s been almost two years now since that process started. So, we ended up getting connected with another company, Finnriver, and I went down there to check out how a cidery works and ended up talking to them. They agreed to make Herb’s Cider for me until I’m able to produce it myself. We’re on the tail end of that. Now, we’re almost finished building our production facility and our tasting room. It’s been just non-stop with a lot of the permits, licensing and legal stuff. It’s a lot of waiting around and getting everyone in sync. Plus, I’ve been on tour since April. We went to Australia and did some shows in Hawaii and then hit the U.S. I’m about to be home soon. We moved up here because my wife (Shama) got a job at Lush Cosmetics, in Vancouver, and they told us to move as close as we can to the border. We moved from the Bay area. Moving to such a big cider region was purely coincidental, and in Bellingham, there are a lot of great places. One of our favorites is Elizabeth Station, it has a ton of ciders and wines and beers, and that helped me get exposed to a lot of really nice ciders from all over. What’s the plan for Herb’s Cider? How will this change your business? We want to expand our styles and come up with our thing. Our tasting room will have more options than we’ll have on retail shelves. Right now, we only have the one style [Single Stroke], and it’s out in our region. It does well, so we want to expand on that. We got a canning line so we’re going into cans. With the existing tanks we have, we’re looking at 4,000 gallons a month at max capacity. It’s a huge step for the company, and I think we’ll be expanding from there pretty quickly. We’re looking to get distribution going outside of Washington, and I want to start a cider club, too, where we offer specialty things up as they become available. Any idea when the doors to Herb’s Cider will open? It’s looking like August, when we’re anticipating everything being ready. We’re doing all we can to make this happen, there are so many different wheels turning it seems like it’s never gonna happen. When I’m home, I’ll be there, and Chris will be in charge of making all the cider and dealing with everything related to that. Also, my wife (Shama) is helping put a team together, she’s so great! Keep an eye on Herb’s Cider’s website and Instagram for updates on these exciting new projects! Once open, find the Herb’s Cider Tasting Room at 1228 Bay St. in Bellingham, Washington.